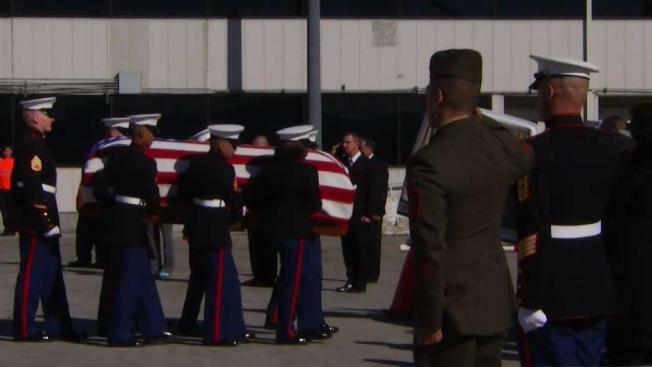 The remains of a World War II Marine who was killed in the South Pacific arrived at San Jose International Airport Friday to be returned to his family in Gilroy. The Masoni family has waited since 1943 for Frank Masoni to return home. Masoni was a Marine cook in the South Pacific but was sent into action and killed in the battle of Tarawa. His family thought his body was never recovered until the military conducted a DNA test matching it to an unknown Marine buried at the National Memorial Cemetery of the Pacific in Honolulu. Turns out, it was Masoni. "A moment that my dad never believed would ever happen in his lifetime," said Frank Masoni's niece, Lanna Sandoval. On Friday, with full military honors, Masoni's casket was guided by the Patriot Motorcycle Club as firefighters manned every overpass from San Jose to Gilroy, saluting the fallen Marine. "It's nice to know our missing veterans are still being looked for and found and returned to their families," said Mike Cabael from the Patriots Motorcycle Club.